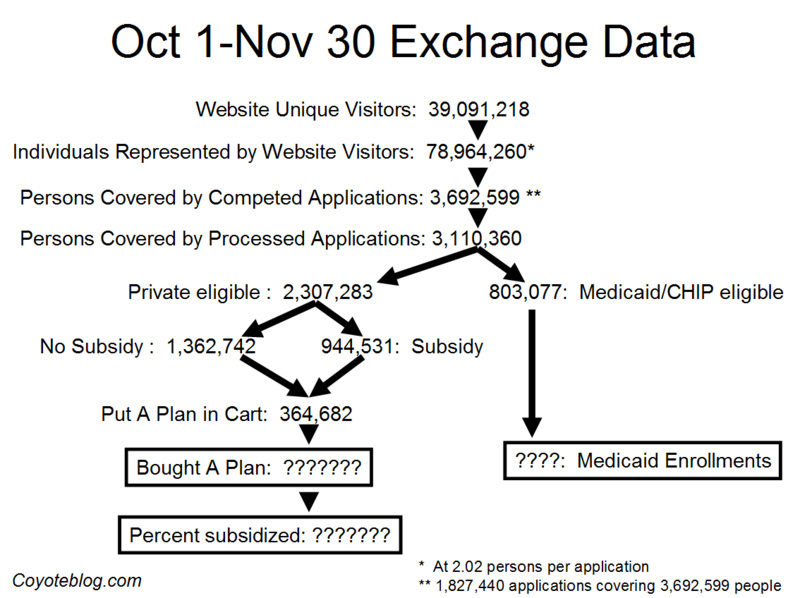 As I did in October, here are the Obamacare Exchange activity numbers to date, based on their recent report. Hopefully this presentation is a lot clearer than the report. I know the nomenclature is kludgy, but it is the report that is a pain to work with. No CEO would ever let one of his business units get away with this garbage. The report shifts from visitors and applications to people covered by applications, presumably to pump the numbers up. This means, for example, that the 364,682 number of people who have selected a plan is actually the number of people covered by plans that have been selected (yeah, awkward, I know). Given that they have on average 2 people covered per plan in their application pool, the actual number of selected plans is half this number. That is the kind of cr*p one has to put up with in this report. 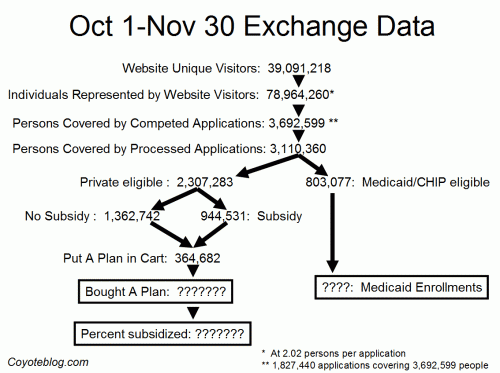 Further, there is no actual enrollment data, just number of people who have put a plan in their online shopping cart. Worse, they have a split of subdidized vs. unsubsidized in their applicant pool, but not for the plan selections. How many of the selected plans are subsidized. My bet is that it is a high percentage, which is why they won't tell us. Someday we will find that few of these people are actually selecting plans they intend to pay for with their own money.